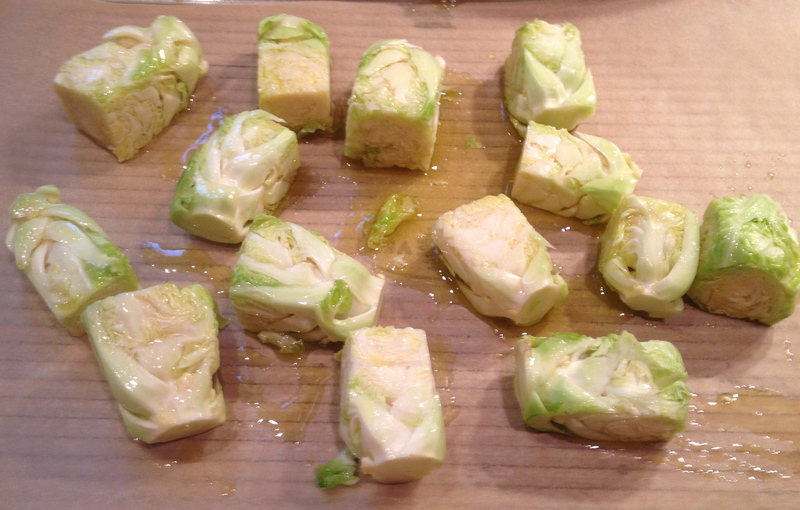 The other night dreamed I was cooking square Brussels sprouts. The next day I went out and bought some largish sprouts. In my dream they were just green cubes but I figured if I cut off the tops and squared the sides I’d end up with something like what I’d dreamed. I also got a bunch of loose leaves. I tossed the sprout cubes with some olive oil and salt and roasted them and then sautéed the leaves with some shallots and garlic. It came out pretty good, but still needs some work so that’s not this week’s recipe. And though I do get ideas for recipes from dreams, more often, they are based on something I’ve eaten at a restaurant or friend’s house. This week’s recipe was inspired by one of my favorite appetizers from FuseBox restaurant in Oakland. Chef Sunhui Chang takes mochi, wraps it with bacon, griddles it, and serves it with some hot mustard and pickled mustard seeds. It is dreamlike in its own way—a combination of gooey and crispy, with the hot mustard cutting the unctuousness. Mochi is a Japanese rice cake that is made by pounding cooked rice into a paste and molding it into cakes, and is available frozen at the Berkeley Bowl and other Asian markets. When I first started playing with this at home I used prosciutto to wrap the mochi. This works well. But when I was looking to do the Feast of Seven Fishes for the holidays last year, I decided to try something else. I wanted a strong flavored fish that could stand up to the mochi’s glutinous quality. Mackerel seemed a good idea (and they had some at Monterey Fish Market). I’ve also made this with sardines if they’re big enough. Preheat your oven to 400°. 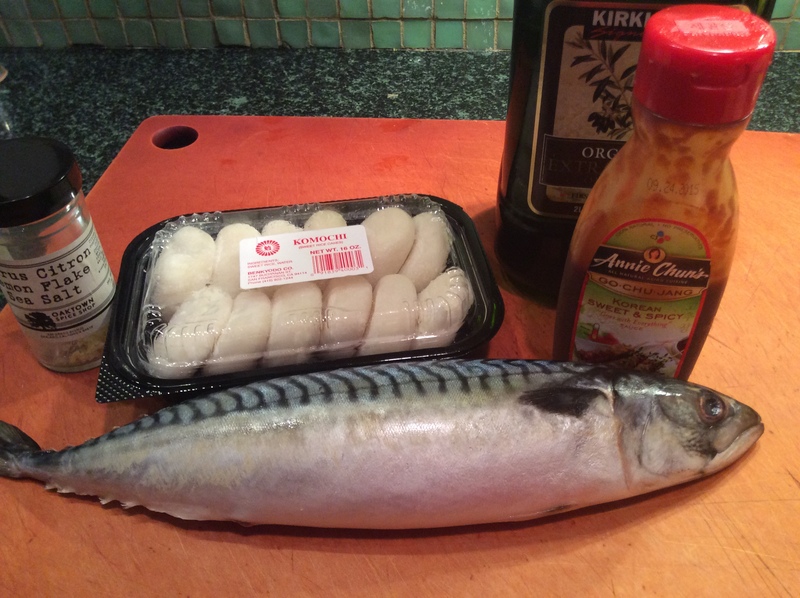 If you haven’t had your fishmonger filet the mackerel, do it yourself. Then take the filets and cut into strips about an inch by five. You should be able to get three pieces per filet. Rub a little olive oil on the skin sides of the fish. Trim the sides off the mochi and cut the squarish center portion into two rectangles. Reserve the side bits. Place the filet skin-side down and rub some of the gochujang on it. Place a mochi piece on the fish and wrap the fish around it. 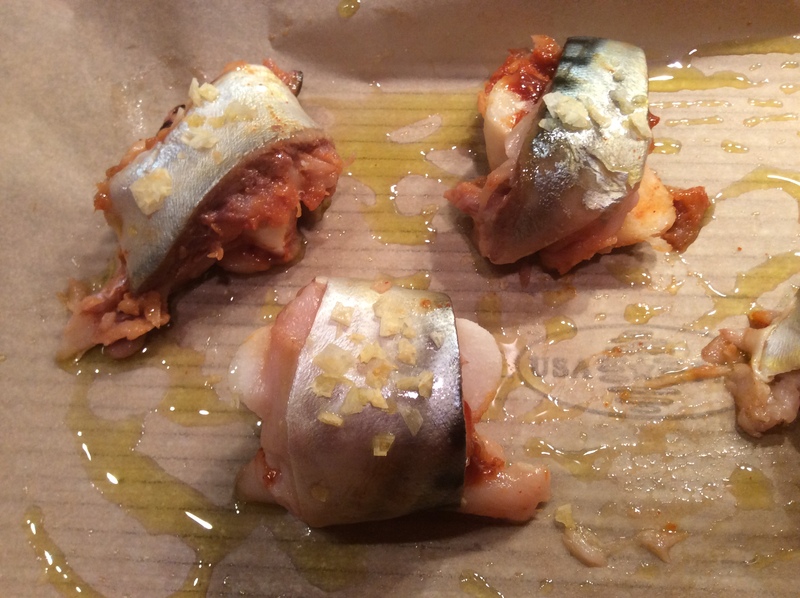 Place on a sheet pan covered with parchment paper, with the ends of the fish piece down. Sprinkle a little salt on fish tops. I like to use Oaktown Spice Shop’s Cyprus Citron Lemon Flake Sea Salt, but any large flake of salt will do. I’ve also used some red Hawaiian salt my sister gave me. Place the pan in the oven and cook for 10 to 12 minutes. You’re looking for the mochi to begin melting and spreading out. Depending on your oven, it may take a few minutes more or less. Mochi is traditionally eaten on New Year’s Day in Japan for luck. If your luck is good, you won’t suffocate from it—an unfortunate result every year, particularly among the elderly. This is why I suggested cutting it into smaller pieces. If you can’t find fresh mackerel, you can pretty much always find frozen Norwegian mackerel at the Berkeley Bowl. In Japanese cuisine, mackerel is called saba. Or, you can use fresh sardines if they are big enough, though you’ll usually only get two filets per fish and it can be a little tougher to get all the pin bones out. Or, you know, you could use some prosciutto or thin cut bacon if you don’t like fish. I’ve tried a vegan version with some yuba (tofu skin) instead of the fish and it was OK, if not quite the same. Gochujang is Korean fermented hot sauce, and is available in Asian markets as well as Whole Foods. I like that it adds a sort of funk to the dish, but BBQ sauce can be substituted—though try for one that isn’t too sweet. I usually serve this on its own, but it would also work on top of a chopped salad or sautéed greens. This is my first recipe here in a while and I’m glad to be back. I’d like to thank Gary and Johnny Ray for their patience as I navigated a time of filial obligation and parental decrepitude. Eat well and often. 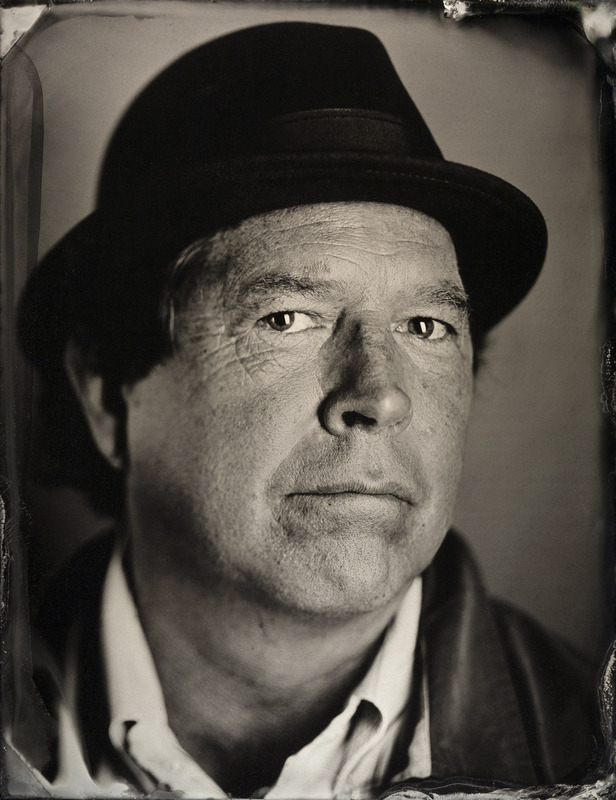 Peter Moore lives, shops, and cooks in Berkeley, California. A co-founder of San Francisco’s Roxie Cinema, he worked in the film world for many years until the lure of food drew him into the world of professional cooking. Shortly thereafter, the lure of day shifts and a medical plan drew him out of restaurants, but his love of cooking remained. He is currently an intern at The Crucible in Oakland and an Operations and Development Associate for the SF Silent Film Festival. 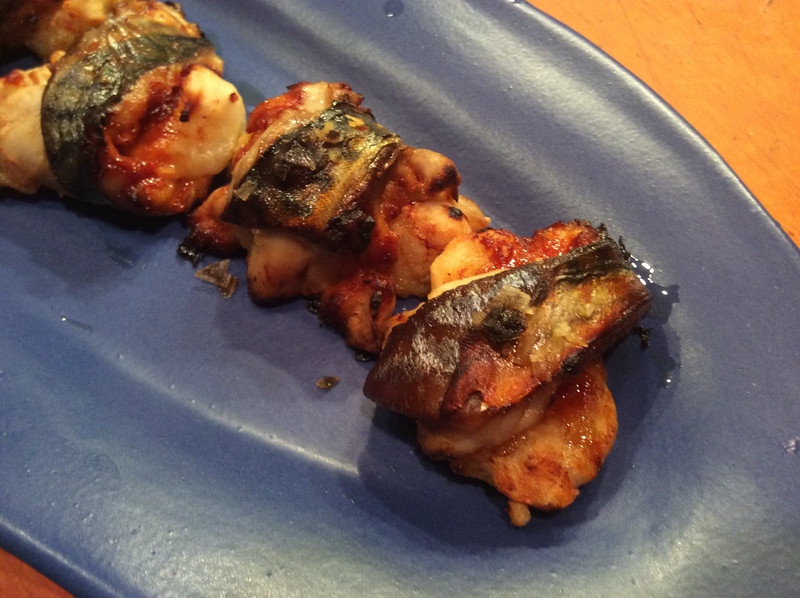 This entry was posted in Eat and tagged mackerel, mochi, Peter Moore. Bookmark the permalink.